Drive and motivation are very similar- this is all about improving Lumen’s drive forward to an obstacle. Super-focused and ready to heel! I’m trying really, really hard to see the good things coming out of this situation with Lu- I have a new one. I’ve been doing lots of trick shaping with her for her 3 meals and I’m noticing more and more the intensity she’s bringing to this training. Not her normal serious intensity, but tail-wagging, happy puppy, throwing herself into the session with speed and enthusiasm. It’s so, so awesome. I love it so much. It makes me laugh, and then she does something even cuter. 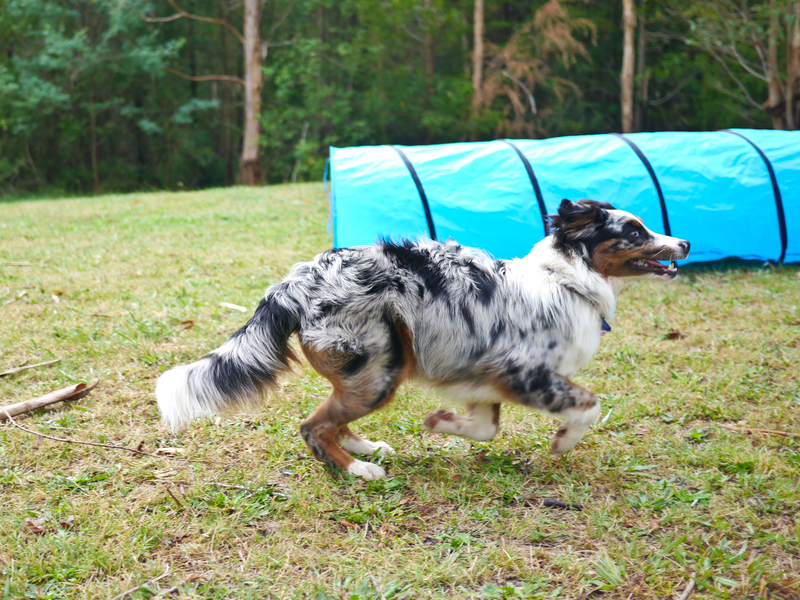 I just so hope that this enthusiasm carries over to when we start agility again. I’m hoping that we’ll have a stronger ‘working’ relationship and more fun between us and this will come out in agility too. Because if she’s this cute and this funny when we’re doing agility, it’s going to be so sweet. So remember ages ago I wanted to increase Lu’s love of tug? Well, I kind of forgot about that for a while but she kept pushing this stinky boring rope at me this afternoon so I thought we’d play a bit. THEN I took her in the training room and did some awesome box games. (just free shaping, but with a box). God I love her attitude sometimes- which is why agility can be so frustrating for me because i see this awesome trying-really-hard attitude at home and we get to the field and she just feels (felt) flat. So after that I took out about 4 or 5 toys of varying values and played tug. I got great, intense tugging for good periods of time out of all of them, and rewarded the first 3 with thrown biscuits, and the last 2 with a deflated soccer ball that she LOVES. I even took the soccer ball off her and she wanted it SO BADLY so I got her to tug with a really average toy- one she doesn’t like much at all, and didn’t want to at first, and then she did and then she got her soccer ball. So, I don’t know. Maybe this is ‘bad trainer’ or something but it was good and fun and she liked it I think and it wore her out a bit because I’m being very good and having a complete rest day. No walks. No agility. Just inside tricks and shaping. 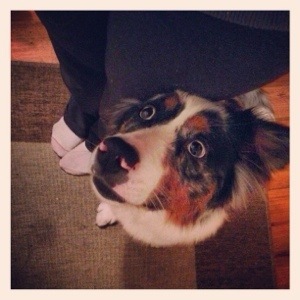 ++people-friendly (loves kids but doesn’t love them enough to get lots of Aussie cuddles. Anyone with an Aussie knows what I mean. She’d rather be off to the next interesting thing than to stick around getting patted). So hopefully with all that, I’d have some stellar puppies that can jump. But I thought I’d wait until she’d been competing for a year (so she’d be 2 and a half) so I can make an informed decision about whether I actually WANT one of her puppies because if she doesn’t do well, then there’s not much point. in other, other news, Silvia said her RC from the video were “beautiful” and confirmed that she currently has a LOT of obstacle focus but that that’s not a bad thing, just that I need to work more come to hand. No probs! I know, I always use the same picture but it’s a good one and it has to do with the post, so why not? Since I was stuck at home being sick until this afternoon when I got to enjoy the sun with Penny and Badger and Lumen, I decided that I’d give obsessively looking for ways to increase motivation and play a rest and read the old sample issues of Clean Run. Well, whaddya know, there were at least 3 articles on play and tugging. How convenient. This afternoon I put it all together while we were doing some shaping and she was into the toy and she game. I also stopped making noise while tugging (one of the articles said that, too) and I’ve been making sure that I keep putting the toy away when she still wants to play. I don’t think she’ll ever be super obsessed and run full-speed to a dead toy – I can get her to do it inside though so maybe outside is possible, I just have to actually train it outside, too. Oh! I also learnt that if she lets go of the toy, it needs to escape – not be offered back to her mouth. I find sometimes this works (and she gets to chase) but sometimes it doesn’t work (she chases but doesn’t grab it again to tug – it’s easier for her to chase it, kind of grab it, then for me to offer it to her for a tug session right then). Nic is being very kind letting me write this while he makes dinner. He is a good husband. Today I went to the field. I had 2 goals: 1 – get Lumen focused, and to play, and 2 – do some Susan Salo jump grids. There were some very important points that came out of tonight, and one huge lesson. I shall dot point them, to prevent me from rambling like I usually do. Got Lu out of car on lead. Put her in the crate. In fact, every time I had to get more food in the treat frizbee or rope or whatever, she was in a drop stay, and every time I had to set the jumps differently, she went in the crate. This meant: no wandering, no sniffing, no investigating the dog behind the fence. What I had? A focused dog who not once sniffed the ground or ate rabbit poo. Look, maybe it was the night but it was awesome. Started with a fun, familiar running game- race to the toy. Actually played this really well compared to on the weekend. She looks at me to see if I’m coming though which means that if I’m not running with her (eg driving to dead toy way ahead) she won’t run as well. Hopefully that will come. Kept exercises very short. Did 2 to 4 reps at most. Didn’t let her play with Mal. Em = Fun, Mal = not fun (well, he is fun, but he’s off limits). Used lots of toys and ran around a lot with her making it really fun and high energy. Haven’t seen freaked-out-monster-leaps for about 2 weeks. YES!!! She does tend to spring-bok the last jump but I think it’s a mix of a) excitement and b) looking for where the reward is. But unlike previously it wasn’t a monster leap because she either took off way too early or felt she needed to jump way too high. YAY, there’s hope!!! If Lumen gives me speed and drive I must reward it, even if she doesn’t do the exercise properly or how I envisaged it. Here’s why: I had a jump grid set up. 3 jumps to bounce, then one where she was meant to do a stride and jump it. I looked at the distance that Susan Salo had suggested and thought: no way, she’s going to do a MASSIVE bounce jump here. Up to this point she’d been running REALLY beautifully, driving forward with speed and awesomeness. It was great. Then we did this one- she was running to her soccer-ball with me out in front… She did it, with speed and awesomeness and… sure enough…! One massive bounce-jump. So I didn’t say anything, and she went to the soccer ball and looked at me and didn’t grab it- she knew. And I knew she knew. 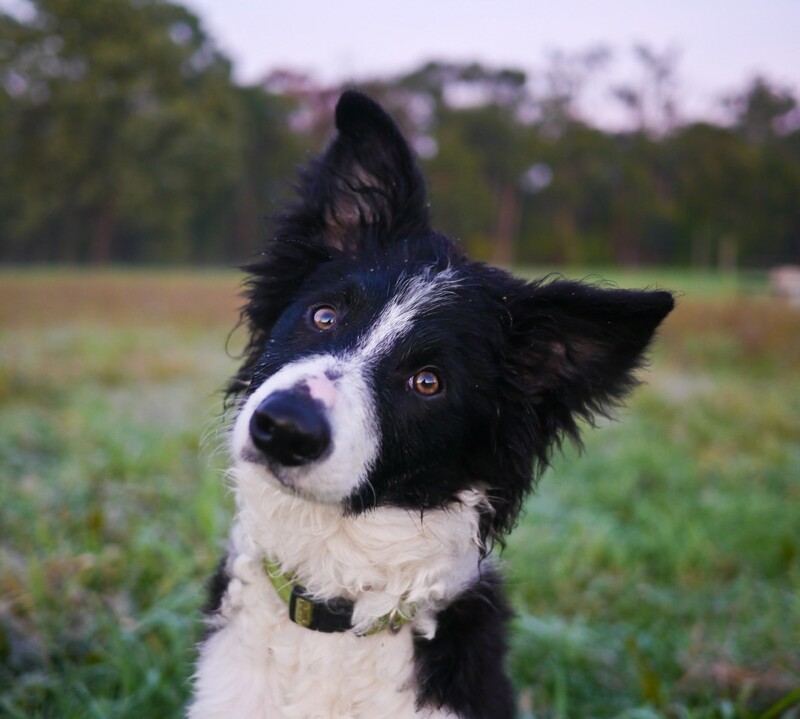 So I was all upbeat and excited and we ran back to the start and set her up and lead out again to her soccer ball… and… I lost maybe a third of the speed we had? She was still OK, but it was cruisy compared to the try before- like she was really over-thinking it, and trying to figure out what she was meant to do – this time, of course, she took the stride and didn’t bounce it, but it wasn’t at speed any more. DARN!!! But wow, how eye-opening to actually see her do it at speed and with drive, and to not get rewarded because she didn’t do it properly, so the next time she slowed right down to make sure she got it right. I’m such a moron!!! So maybe my mantra will have to be: ‘reward all speed even if she messes it up’ and we can work on perfecting it later. Well! On Monday evening we popped down to our new agility field and got set up. The lights are amazing, with good visiblity even when the sun had gone down. YES! My winter worries are now over! Hurrah! I started Lumen off doing a bit of pre-serpentine work. We’re up to number 2-3 in this diagram. Tonight I angled the jumps just slightly more than 2, but not all the way to 3. She’s taken to this amazingly well… and… what’s more, I had the three jumps into a curved tunnel and my girl was flying. I don’t know what happened but something has clicked and she’s gone: Ohhhhh… you wanted me to go FAST?! And… she’s blitzing. Before, I could outrun her to about the second or third jump before she’d overtake me and run leisurely into the curved tunnel… Tonight, she overtook me halfway between the first and second jumps AND BLITZED INTO THE TUNNEL. She’s not been a huge fan of a curved tunnel but tonight… it was amazing. I just wanted to do it again and again but I didn’t, I stopped so I didn’t overdo it! I wish I had it on video, it felt that good. In the last week or two, she just seems to be getting better and better, and faster and faster. Now to figure out how to deal with all that speed!! The problem I’m now having is setting the jumps in a straight line into the tunnel for extension/collection exercises, she completely ignored my cik/tok because she was so intent on the tunnel!!! And because she’s now actually got some speed happening, she’s not turning as nicely as she was… So I might do a jump-wrap-thrown toy type exercise, as she runs fast in a line of straight jumps so the first jump should get her speed and the second will be a fast wrap… There’s no point practising from a stand-still because the speed is so dramatically different if I send her from stationary vs. her running in from a jump. It’s amazing though because I’m calling the cik/tok command as she’s going over the jump before the wrap to give her enough time!!! Jeez my handling is going to have to be spot-on with this girl. We worked on some weave entries, too, but I find they’re difficult. I’ve gone back to starting her closer on the angle she finds difficult, and then moving her backwards gradually, before I make the angle more difficult. Hopefully this will help as we’re at a bit of a wall. Silvia Trkman says that finding entries becomes easier for them as the channel narrows so I don’t know how much work to do on entries with a wider (80cm) channel, vs. closing the channel more and then doing harder entries. On Tuesday nights we’re going to a small-group class for foundation skills, more wraps around noodles, shaping, crate games etc… All of this is more beneficial though for teaching her to focus on me even with exciting things going on around her. And I’ll tell you what, apart from if we’re just standing still waiting for our turn through the tunnel or something, she doesn’t get distracted at all. What a stellar pup. As far as tricks go, I’ve been teaching her to back up up the stairs outside our house. I was hoping it would help her with the double-foot hopping motion she needs to do a handstand but so far it’s one back foot then the other. This is our main focus for the next 2 weeks. Getting Lumen to run. To see that agility, cik/cap, tunnels, jumps and everything, is just about running. Look, I don’t think she’ll ever be a dog who is silly and just goes crazy. She’s a thinker, she thinks. She over-thinks. But, she adores doing our channel weaves and our running contacts and straight tunnels because she gets to chase a ball, flat-out. And I haven’t been able to transfer that to cik/cap. So I thought, you know what, I’m going to set up some scenarios where she just has to run to catch me… and when she gets that, I’ll throw in a turn every now and then. Therefore, cik/cap become part of the ‘run-fast-and-chase’ game. Ah ha! 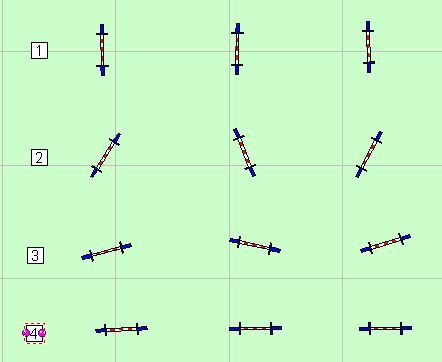 So far we’ve done some speed circles (two curved tunnels facing each other with a little 10cm jump between), and a straight line of jumps/jump bumps with a curved tunnel at the end. She seems to be running. She’s jumping absolutely ridiculously high every now and then for how low the bars are (I think she thinks it’s fun to leap), but she’s throwing in the cik/cap really well- I can tell the difference in her jump AND, she’s turning her head and her feet as she approaches the jump. Because I’d patterned her a little to the circle or the straight, she was coming into the turn at her running speed, too. She’s also driving in and out of curved tunnels really nicely from these exercises, which is a bonus as I can use that drive to get speed for running contacts and weaves. It’s funny, because Husband has been saying for a while now that I need to do more ‘stuff’ (eg. obstacles) but I was very fixated on the Foundation Course, and didn’t want to stray, at all, from the program. Yet, I really think that Lumen needs some opportunities to see that it’s not all about serious thinking- jumps and tunnels and turns- it’s about running, and changing direction and running some more. And it’s funny because with Mallei, I was always such a huge believer in my own philosophy of ‘do what is right for you and your dog’. It worked for us! I didn’t necessarily want to subscribe to this method or that, because whatever we’d been doing was working for us… and yet, I threw that our the window for Lumen and tried doing cik/cap from a static, like I was told.. and we got bogged down in it more and more. Then I find she loves running around the far-apart trees… she loves running… but we couldn’t make the connection with cik/cap… so… that’s what I’m trying to do- show her that cik/cap is just another part of the fun running and chasing game. If nothing else, I’m certainly getting an excellent workout, even if she’s not- all this sprinting back and forth makes me hot, puffed, and sweaty! Then I get to cart sand bags and equipment back to the car! You know sometimes you think and think on something and then suddenly realise something that maybe has been staring you in the face all along? No? Was that sentence unnecessarily confusing? Possibly. In any case, that happened to me today. I decided I’d try an exercise using little ‘jump bumps’ (sawn in half PVC pipes) and put a low bar at the end for cik/cap. My thought was that Lu seemed, at least, to go so quickly as a younger puppy, why was she slowing down now for cik/cap? I decided to copy the old exercise with the cik/cap twist and see what she’d do. First attempt was messy at the end, but that’s ok.
2nd was better, and fast! (I thought so anyway)…. Did a few more, then said: “ok, go sniff!” now, this isn’t an official command yet but sometimes I think we do so much and she goes and sniffs just to have a break, so I’m working those breaks in – with permission! Then we did it again! Still good! This time I had a different toy. And somewhere throughout this process I thought- Lumen gets bored. Do dogs get bored? 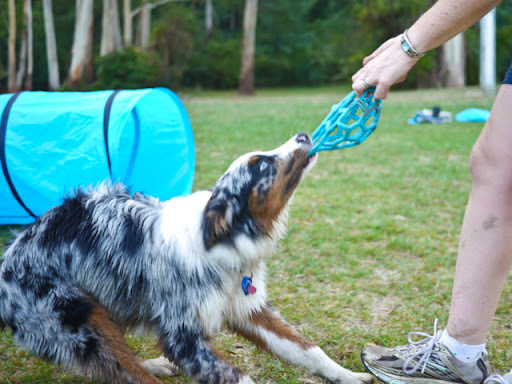 Well, everything I’d read about getting a puppy suggested you should rotate their toys so they don’t get bored- why shouldn’t this apply to agility? I also thought that she seemed to do well the first time we try something new- eg. she’d be fast and good. First time we tried cik/cap around far apart trees? Awesome!!! Best fun we’d had in ages. Next time we did it? Less good. Time after that? Less good again, etc etc etc. Same with toys. We’d been playing with a particular tug toy for about 3 or 4 turns down this row of ‘bumps’ to the cik/cap at the end. We had a quick break (I was puffed – still not fit enough!) and I showed her the toy. Her expression said: “meh”. I got out a different one: Excitement!!! Ok. So. My thought (and this is sort of like: “What we’re working on” in a long and round-about way) is that I need to not repeat an activity so often. Because I’d do cik/cap around the trees for 3 days in a row… So if I do… cik/cap trees one day, jump-bump cik/cap the next, 500-ball-game-cik/cap the next, tunnel-to-cik/cap-figure-8s the next… not even every day (though I like to, because I think it’s important, and I’m impatient to ‘get it right’), but just… keep changing how we do it so she’s always finding it different, having to think.. I also think she needs regular sniff breaks and today I also threw a small handful of food in the grass every couple of goes after a good play, so she could have some ‘processing time’ as she foraged for food.